When you’ve got meat and cheese, who needs carbs? The carnivorous lifestyle is hot topic in the low carb world. This meat eating diet consists of animal foods alone. You don’t have to follow any rules as far as food timing, macronutrient breakdowns, or portions.Simply eat when you’re hungry and until you’re full. Although it’s hard to reconcile the assumption that a carnivore diet is not only safe but helps to improve your health, I have decided to compile this work for you. And, since meat is one of my favorite foods, who else better to do that for you? Feed your inner carnivore with these amazing high protein meat recipes. 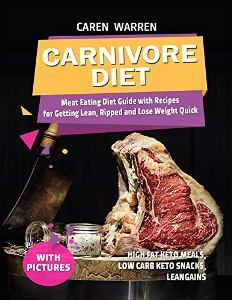 “Carnivore Diet: Meat Eating Diet Guide with Recipes for Getting Lean, Ripped and Lose Fat Quick (high fat keto meals, low carb keto snacks, leangains)” by Caren Warren is pure goodness in the palm of your hand! • easy to prepare recipes, beautifully laid out with gorgeous photography – making them a joy to create! • strong carnivore diet benefits: weight loss, better heart health, lower inflammation, higher testosterone, fewer digestive problems, increased mental clarity and simpler dieting. Burn fat, Feel incredible, Boost your energy, Satisfy your tooth living your Carnivorous Lifestyle. Still craving Rib Eye Steak? So, Fry it and Try it!